If you've been watching the steady flood of new music and videos that has bombarded us recently, you know that separating the truly great offerings from the just-average releases can be a daunting task. Why not let Exclaim! do the hard work for you? In today's Music/Video roundup, you'll find the most talked-about music videos, tracks and album streams all in one convenient place. You can take a well-deserved break from scouring the internet for the latest and greatest, because we've got it all right here. 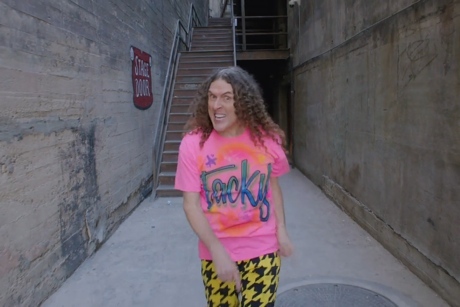 "Weird Al" Yankovic has been dominating the internet lately with a whole slew of clever music videos for some choice tracks off his new album, Mandatory Fun. You can watch the prolific parodist spoof Iggy Azalea's massive hit in his video for "Handy," see him enforce grammar rules in the "Word Crimes" video and catch some appearances from a few of Al's garishly dressed friends in his video for "Tacky." But that's not all — you can find the videos for "Foil," "The Sports Song," "First World Problems," "Lame Claim to Fame" and "Mission Statement" as well. In a similarly weird vein, a mysterious yet long-awaited collab came our way this week from Tyler, the Creator and Mac DeMarco. It's a sketch from Odd Future's Loiter Squad on Adult Swim, in which Tyler fantasizes about an elderly woman while Mac plays some background music. See what we mean at the link above. The Devin Cuddy Band offered up a stream of the new album, Kitchen Knife, this week — hear its bluesy sway at the link above. We also have a stream of Saturnalia Regalia!, the latest from Halifax psych-pop act Monomyth. Listen to it to find all the genre-bending goodness this release has to offer. Finish things off with the Underachievers' urban-set "Metropolis" video, and a stream of Majid Jordan's smooth new track "Her." Craving more? Stop by our Music/Video section for brand new tracks, music videos and album streams every day.